Get 20% discount using promo code THEBUTTONBOX. The celebrate the opening of my new Etsy Shop, I am holding a giveaway! This giveaway is open to all my lovely followers . One lucky winner will be chosen at random to win a Button Box Baby Goodie Bag. This will contain some of my most popular items. To be in with a chance of winning, please enter your details below. One Winner will be contacted within 24hours of winning. I will check before contacting to confirm all entries are completed correctly. Today is a rather exciting day for me, as I have finally launched my Etsy baby shop. I will be selling items such baby hair bands, clips, bibs, baby clothing and breast feeding shawls. All hand made by ME! What I need is some lovely yummy mummy's & cutie baby's to test and review some of my items. It is completely free. Please email me at thebuttonbox1@gmail.com if you are interested in being a future product reviewer. Link to your blog, instagram or twitter account. what type of items you would like to review. Also in the near future I will be launching some non baby products, so any fashion bloggers also interested in reviewing any future products. Please keep your eyes pealed! Check out Thebuttonboxshop for your shopping needs! all items are lovingly hand made and packaged by me. So Friday was a big day for me. . . It was my last day of work. I'm now 32 weeks pregnant, and I'm in full nesting mode so wanted to finish up work 8 weeks early, giving me time to rest, get the house ready and spend lots of time with my son Alfie. My lovely colleagues well and truly spoilt me with a missive hamper of baby goodies and cakes. It was a lovely day and very much appreciated. 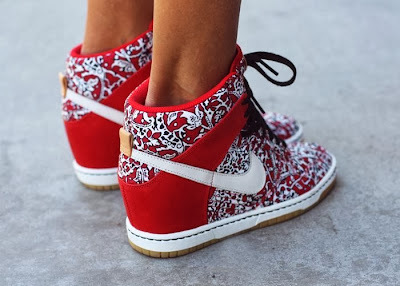 I'm obsessing over . . .
. . . Nike Dunk Sky High Tops, I'm completely obsessed! Accessories are the best way to update and transform any outfit. My new place to go is Dixi. They have everything from simple chic pieces to stunning statement pieces. I am building quite a nice Dixi collection. But obviously there is room for more!